RMK Autumn Mystique 2009 is here! Girls, do you know why Plusizekitten Loves RMK Base Make Up? this is your chance to find out! 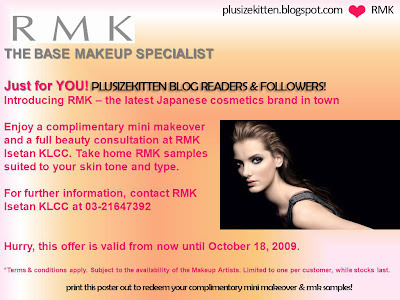 from now until Oct 18th, 2009 Plusizekitten blog readers and followers will get to experience a complimentary mini makeover & take home personalized RMK samples! Yes girls, all you need to do is print out this poster and take it to RMK Isetan, KLCC to redeem your samples and make an appointment for your mini makeover with Ms.Lilian (MakeUp artist) at 03-21647392, RMK Isetan KLCC. Specially for Plusizekitten's Blog Readers & Followers! Spread the word and spread the cheer! permission granted! i've called them..n they said we can go there and enjoy this..i want to go there by this noon..=) cant wait to try the sample..
RMK's Lillian is great at make-up and absolutely fabulous dealing with eyebrows. Wish i could go :-( but highly recommend to anyone who has the time to do so. Wowww free makeover? ?Can I go Miu?Need to make appointment with Lilian first? Cuna: yes cuna u can go! just print ini poster out n go book with Lilian on phone. So far rmk isetan klcc is the best make up service & eye brow trimming from Lilian. Others counters I haven't try yet. T___T u go submit the poster n take sample by 18th, but booked ur mini makeover after that lah. also wondering why you like MV's Kiehl's. I think that one is my least fave. Oh wow!!! This is great! I want! Just print and book appointment thru phone rite? No purchase needed eh? abby: ending this 18th Oct darling but maybe u should redeem first and ask if u can book on a later date. reena: yes babe print out n go! :) no purchase needed. Lisa: T___T wuuhh u.. bring ur baby along! I'll let Lilian know u wan to do on a later date :) just submit poster first yah! I will definitely print it out and proceed to the counter soon! Jean: go go! :) Lilian's make up is the bomb! my app is on fri.. :) can't wait to try their products..
can i get samples for both skincare n foundation..? so greedy.. lol! Fatin: if you're interested to try out, why not! Did u make an appointment before heading there to redeem your mini makeover? As stated on my blog post u need to make an appointment with the make up artist and on the poster the mini makeover is subjected to the availability of the make up artist. As a rule of thumb, always call to make an appointment first for a make up session. It is quite the norm for almost all make up counters unless the make up artist is free when you pop up suddenly and there's no customers to serve. The promotion is a mini makeover and not a full makeover to let you try RMK Make up. If you're interested to have a full makeover for dinners or events, you may inquire from the make up artist Lilian if this promotion is applicable. You know this afternoon I just make a call as I keep waiting I have no idea they will call me or not. As what I expected, nobody bother to call me even last nite they REQUESTED me to give them contact to give me return call. Then I called to look for Lilian but she is off duty today. So I talked to that person sound like a guy then I told him that I wana make an appointment. Then that SA keep saying no need to make any appointment, jt walk-in directly will do. Then I told him this was what I did last nite but i went bk with empty-handed. He kept saying no worry that I could jt go over anytime by 18th which I totally lost the my trust on them as different SA gave me different answers. I didn't expect a full make over at all. Previously what I mentioned dos were the reasons/excuse given by the SA last nite I dropped by thr. I just want test their product as a new customer that's all. I do not expect how good mini make over they can do for me after all these ding dong. In fact I still have my perfect make over redemption with Shu Uemura valid for a year which I could go for if I really need it.Just to share my experience here! Already make booking the time right? I will let Lilian know about your complaint! do u want to do another makeover by her? it's better everyone do makeover with Lilian, not anyone else. i know u do recommended lilian but i late for booking so not much time available. Since that day only 2 person available in the counter and lilian also not free then we also dun want to give them trouble and i never think that gal will service us like that. i been using rmk products for 2 years and most of the RMK sales girl is good service. Usually i will visit Isetan KLCC n Parkson pavilion counter and all the sales person there also nice. The *wong sales gal i never meet her before. Anyway, just to let you know the situation during the makeover service and i will book for lilian next time if any promotion again. ally can email me your details n contact? i wan get Lilian to call u back to apologized. This promotion extended to end of this month due to too many ppl bookin in short time. Miu, already email ur my details but since i already tried the makeover and prefer to give the chances to other who not able to book last week. Did Lilian called u? i told her your complain. Hope she calls you? If anything, the best person to speak to is Lilian as she's person in charge of this promotion at her counter.